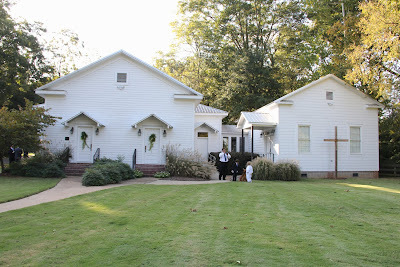 > When we arrived for Scott Morris and Katie Linde’s wedding Saturday afternoon at Taylor Methodist Church in Taylor, Mississippi—seven miles south of Oxford—we knew this was not going to be your average wedding. (My companions for the wedding were my husband, Bill, and our friend, Jere Hoar. We were meeting up with my writing buddy, Doug McLain.) 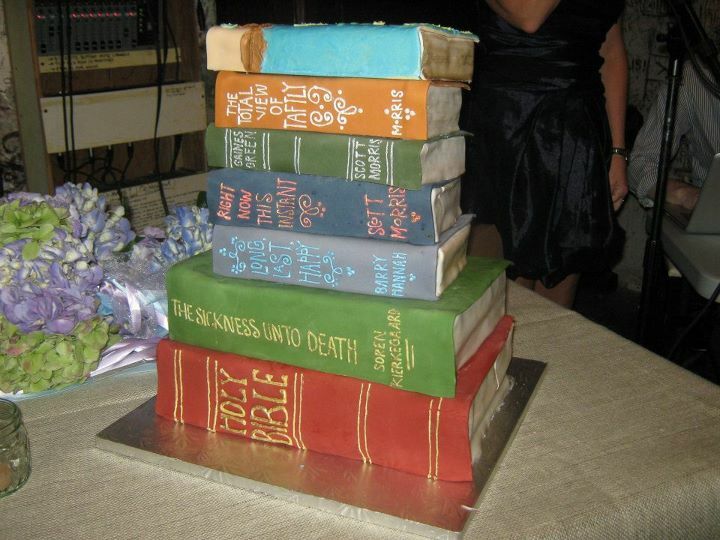 First of all, the bride is an artist and model in New York City, and the groom is a published author of literary fiction. Their sisters and several of the groomsmen are accomplished actors. Katie’s family is from Nashville while Scott’s is from Florida. But Katie fell in love with Oxford and its surroundings when Scott proposed marriage to her at the historic College Hill Church during her first visit in June. Scott was leading the manuscript critique sessions at the Yoknapatawpha Summer Writers Workshop (and no, I didn’t make that name up—William Faulkner did) and brought Katie with him to meet his Mississippi friends. And we all fell in love with Katie and her sweet spirit. Katie’s daughter Lindie served as both Flower Girl and Maid of Honor. 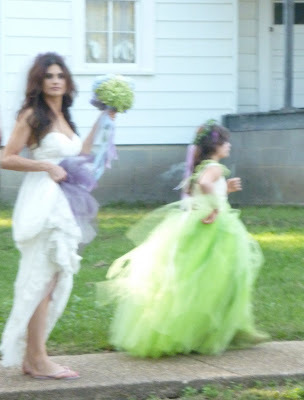 In her green tulle dress with a crown of flowers and flowing ribbons, she reminded me of a forest nymph from a Shakespeare play. The other bridesmaids dressed in purple bubble dresses. All this color contrasted beautifully with the white clapboard church and its verdant lawn. And then there was the music. Katie’s father is the late Dennis Linde, Nashville songwriter best known for writing the 1972 Elvis Presley hit, “Burning Love.” A tape of Linde singing another of his hits, “Peaceful,” was played during the processional, and then “Burning Love” was played as the recessional for the wedding ceremony, and it was hard not to start dancing in the aisles. There was even a copy of Linde’s original hand-written draft of the lyrics included in the wedding program, which was adorned with Katie’s original artwork and Scott’s lyric prose. the wedding ceremony began. 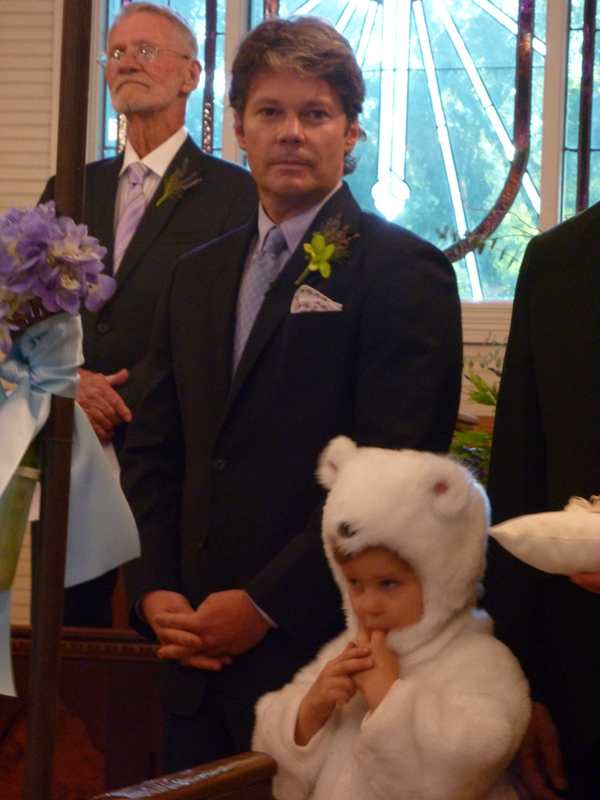 And there he was—walking down the aisle in that bear costume, carrying the wedding rings on a white satin pillow. Taking his place beside the groom, he sucked his fingers shyly as he faced his adoring audience. I asked someone nearby why he was dressed that way and they said that when he was asked to be the “ring bearer” for the wedding, he thought they said, “ring bear,” and he was thrilled, so long as he could wear a bear suit. And so the last member of the wedding party listed in the program is Micah Polaha, “Ring Bear.” It’s not surprising that Micah’s parents—Julianne and Kristoffer Polaha, sister and brother-in-law of the groom—are both actors. The Ring Bear’s future looks bright. Passing Shot: the wedding cake! Congratulations and Many Years to Katie and Scott!